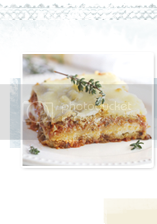 I'm so excited that today's guest post is Jennifer from Delicieux. I've been following her blog for quite sometime and is one of my favorite reads. She lives in Australia (Lucky, I know! ), has a cute aussie accent (I adore australian accents!) and is sweet as can be. Her blog is a vegetarian based blog with lots of delicious bakes goods, beautiful photos and delicious recipes! I'm sure you will enjoy Delicieux as much as I do! I was thrilled and delighted when the lovely Katie (from Epicurean Mom) asked me if I would like to guest post for her while she is on holiday in Montana with her family. Being a fan of Katie's beautiful blog I couldn't wait to say yes; and I surprised Katie when I told her this would be my first guest post! The beauty of this cake is it's so simple to prepare. 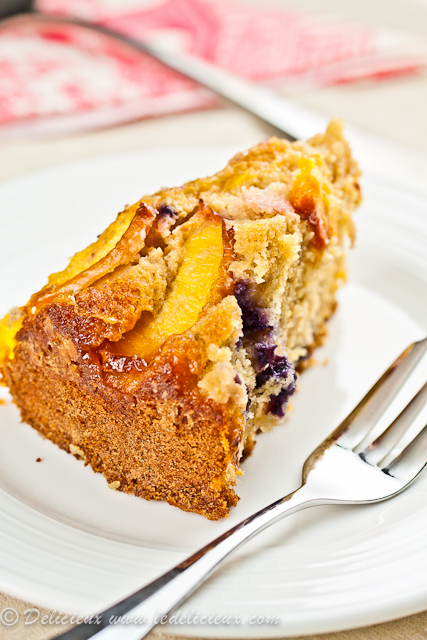 Simply mix all of the ingredients together, pour into a greased cake tin and top with slices of nectarine. Just the type of recipe that any busy mother needs in her repertoire for when you get the last minute call that guests are coming over. 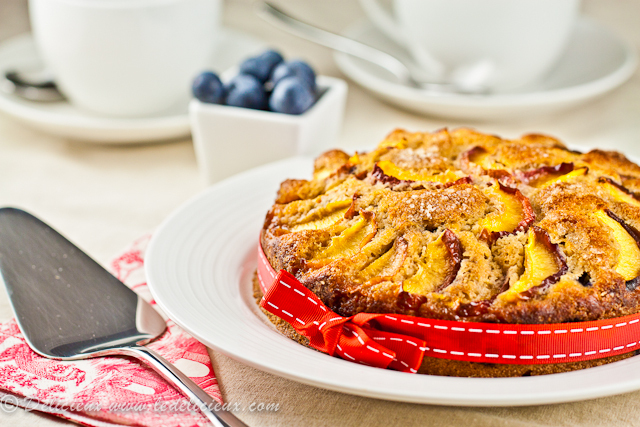 Even better, you can easily adapt this cake and work with whatever fruit is in season. With the hustle and bustle of getting ready for the holidays, its wonderful to take sometime out from all the Christmas baking and make something quick and simple. This cake is just the thing to enjoy over a relaxing cup of tea , while you check off your christmas to-do-list. Thank You Katie for letting me take over your beautiful blog for the day. Preheat oven to 325 degrees fahrenheit (160 degrees celsius), grease and flour a 20cm springform cake pan. With an electric mixer, fitted with the paddle attachment, add all of the ingredients except the nectarine, blueberries and demarara sugar. Mix until well combined. Add the blueberries and fold through before pouring the mixture into the springform pan. 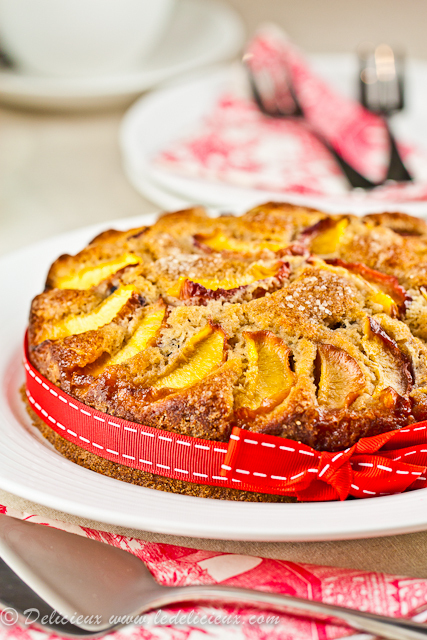 Top with sliced nectarine and sprinkle with demerara sugar. Bake for 45 minutes or until the cake is cooked through. Let cool, slightly. That cake is fabulous and so tempting! A real treat. Thank you Katie, for your kind words. You are so sweet. As for the Australian accent being cute...I don't know about that LOL! When my fiance and I holidayed in the US in June this year we kept being mistaken for English instead of Australian. We thought it was hilarious. Thank you again for letting me take over your blog for the day. I feel honoured. Enjoy the rest of your holiday! This cake looks absolutely delicious! Beautiful pictures and the combo of nectarines and blueberries sounds amazing! 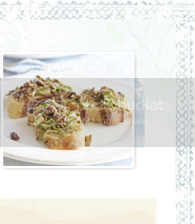 This looks wonderful--can't wait to try it! What a yummy cake! I would love to have a few bites (or even the whole cake!) I loved this post. This is beautiful, and sounds lovely. Thanks for introducing me to a new blogger, Katie! Gorgeous cake Jennifer! (said with my cute Aussie accent) You've gotta love anything with nectarines! Thank you everyone for your kind words. It was an absolute pleasure to bake for the lovely Katie. Haha thanks John :D And I'm sure your Aussie accent is cute too! Thanks again Katie for letting me take over your beautiful blog. Hopping over from Jen's blog. Gorgeous cake -- very festive!